At the end of 2011, I came upon something called 101 in 1001. The premise is that you come up with 101 things to do and you have 1001 days in which to complete them. You can put whatever you want on the list, from ‘learn to knit’ to ‘visit London’ to ‘make a dentist appointment’. I whipped up a list and set the start date for January 1, 2012. That means I’ve been chipping away at the list for little over a year now, with about 40 items completed so far. It’s the kind of thing that it’s nice to check in on every once in awhile, to see if you finished something off or if you’re looking for something to do. 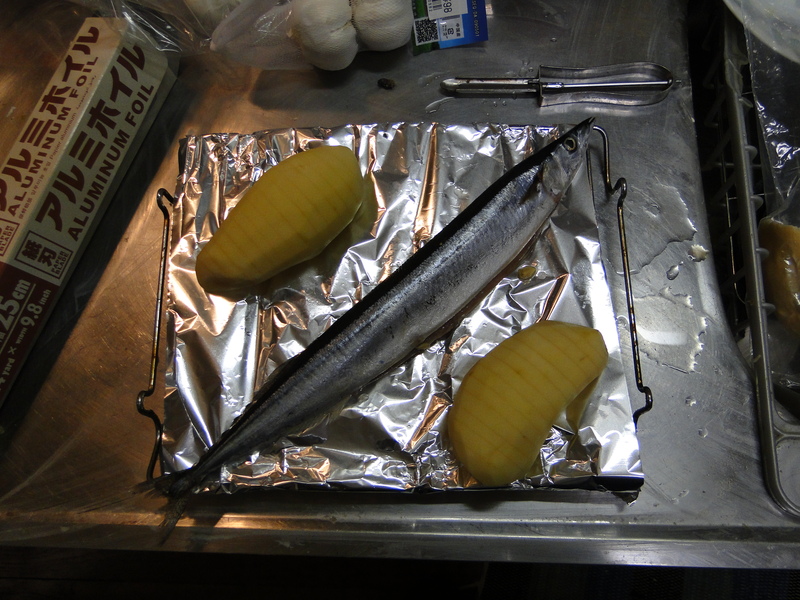 One of the items on my list was ‘cook a sanma fish and eat it’. 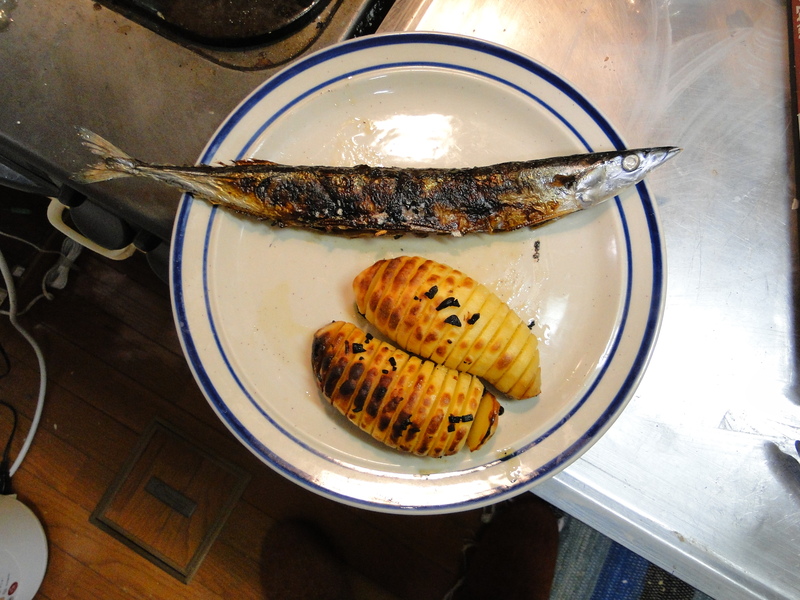 Sanma is what the Japanese call Pacific Saury – it’s a type of fish that’s commonly eaten grilled. I added it to my list because 1) I rarely cook fish, even though I like it, and 2) when I do cook fish, it’s usually in big thick fillets. This was a more Japanese-style experience, fish cooked whole with head and tail intact. Sanma is actually at it’s peak in autumn, which I knew…except that in autumn, you can’t find anyone who will sell you one sanma fish. They come in packs of three at least. I ended up waiting until the end of January, when they finally started to appear individually. I grabbed a produce bag and selected this fine specimen. Normally, I don’t have a problem with my food having a face. Especially in this case – alive, it was a fish, big deal? Dead, it was highly tasty. There was just one obstacle – gutting the fish. Then it started muttering about offal. Needless to say, it took a few minutes to work up to sticking my fingers into the cavity and yanking out the digestive track (bless fish for having such simple organ systems). Disemboweled and ready to roll. I prepared the fish following these instructions, while the potatoes got this treatment. The fish was cooked in my fish grill, a shoebox-sized gas oven that is part of the same system as my gas burners. The potatoes were baked in my microwave oven, which has an actual oven setting. I didn’t use enough salt on the fish and the potatoes were strangely sweet, but everything was quite tasty otherwise. 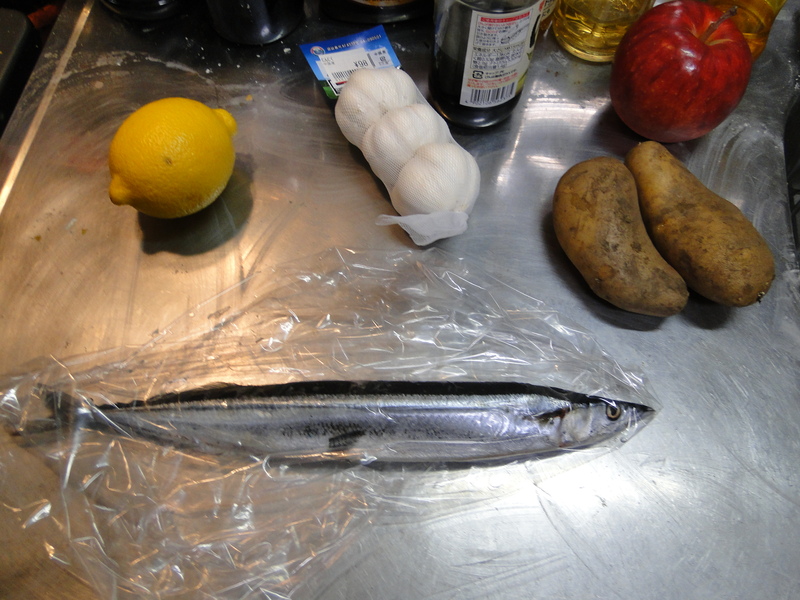 Sanma can be messy to eat if you don’t know how to remove the bones, but I managed. Now, if you’ll excuse me, I think I’m done food-blogging for the forseeable future.